More than 250 sheet metal apprentices traveled to Las Vegas to compete in the 40th Annual International Sheet Metal Competition hosted by the International Training Institute (ITI) for the sheet metal and air conditioning industry. LAS VEGAS – More than 250 sheet metal apprentices and their families from the United States and Canada ventured to Las Vegas March 5-9 for the 40th Annual International Sheet Metal Competition hosted by the International Training Institute (ITI) for the sheet metal and air conditioning industry. Five apprentices from Sheet Metal Local Joint Apprenticeship Training Centers around the United States took top honors in the five sheet metal disciplines open to apprentices only: HVAC (heating, ventilating and air conditioning), industrial/welding, service, architectural and TAB (Testing, Adjusting and Balancing in heating and air conditioning). Detailing, the sixth category, was open to journeymen and apprentices. On Jan. 11, the 12 finalists who would be allowed to compete in the category at the competition – 11 journeymen and one apprentice – were announced. The detailing category, now in its second year, was added as a result of a shift in the industry. Detailing skills – which allow sheet metal workers to generate and manage building data on the computer using building information modeling software – are becoming increasingly in-demand in the industry. To encourage sheet metal workers to get certified in ITI’s Benchmark BIM training software, ITI awarded the winner of the detailing category with a brand new Fat Boy Lo Harley-Davidson motorcycle from Henderson Harley-Davidson. Industrial: Josh Lohman, 28, Kennewick, Wash. Architectural: James Alsteen, 25, Milwaukee, Wisc. HVAC: Aaron VanRheen, 27, Portland, Ore.
Service: Thomas Sorensen, 38, Fairfax, Calif. Testing Adjusting Balancing (TAB): William Kerner, 32, Stafford, Va.
Joey Hovarter, 36, of Moore, Okla. – employed by Matherly Mechanical Contractors LLC in Midwest City, Okla. – received first place in the detailing category and drove away with the big prize – the Harley-Davidson motorcycle. 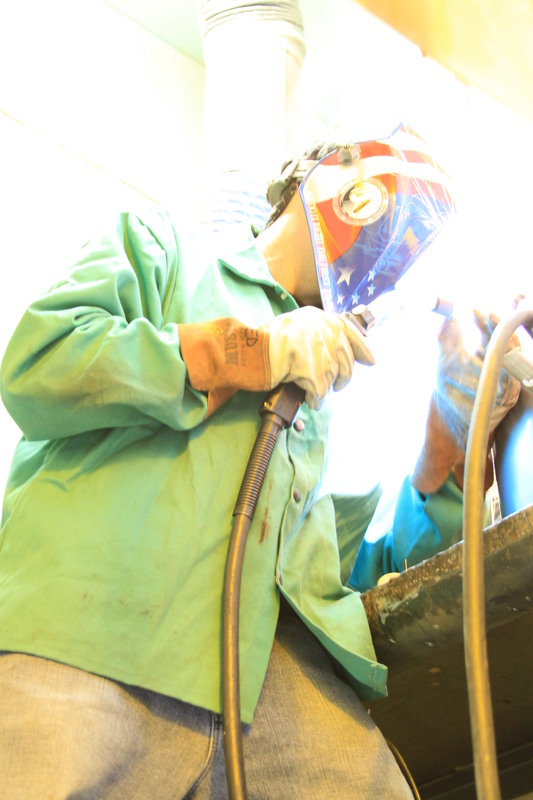 More than 15,000 apprentices are registered at training facilities in the United States and Canada. The International Training Institute (best known as ITI) is jointly sponsored by Sheet Metal Worker’s International Association (SMWIA) and the Sheet Metal and Air Conditioning Contractors’ National Association (SMACNA). ITI supports apprenticeship and advanced career training for union workers in the sheet metal industry throughout the United States and Canada. Located in Alexandria, Va., ITI produces a standardized sheet metal curriculum supported by a wide variety of training materials free of charge to sheet metal apprentices and journeymen.